Did you know you can build a mobile app using your WordPress website? Modern nonprofits realize that mobile is incredibly important to connect with their audience. You probably know that more people access the internet on mobile than on desktop, but did you know that mobile apps are used even more? In fact, we spend more than 80% of our device time in apps. If your nonprofit has a great mobile website, you are definitely ahead of the curve. But what about an app? Is it important? Is it feasible? Your organization can build an affordable mobile app that connects with your audience in new and exciting ways. You can even create a fundraising app that takes donations using the GiveWP forms on your WordPress website. We already talked about how people use mobile apps more than the web, but what specific benefits can your organization get from an app? The other day, I was sitting in front of my computer and I wanted to check my bank account. I could have visited the website on my computer but instead, I picked up my phone and used my bank app. Why? Because I know it’s faster, even if only by a couple of seconds. An app is easier because I don’t have to open my browser, type in the URL, click the menu item I want, login, etc. I click the app icon and maybe one more tap to get what I want. If your content is easy to access through an app, your engagement goes up. More people view it more often. If you use GiveWP on your site, you can add a donation form right in the app that takes users to your website to donate. You can also incorporate SMS donations so it’s easy to donate through texts. Making it easier and faster to give will bring in more donations. These days we are bombarded with emails, calls, and social media messages. If you have something important to share with your audience, how do you cut through the noise? You can tweet, email, and buy ads, but the engagement is low unless you spend loads of cash. When you send an email to your audience, an open rate of around 30% is typical, and click-throughs are much lower, usually below 10%. Unless you are a rockstar like Gary V, you probably don’t get much engagement on social media. If you want to get more of your audience to view your messages, there’s only 1 thing that is viewed almost 100% of the time: a push notification. A push notification is like a text message. It’s almost impossible to ignore. Since most nonprofits don’t text supporters and donors, the best way to get a message onto their phone’s locked screen is a push notification. Most of us carry our phones in our pockets and check them multiple times per day, so you can almost guarantee they are going to see your message. An app gets you a piece of the most valuable real estate you could possibly own: a spot on your customer’s home screen. Seeing your organization’s icon on their home screen keeps you top of mind. Plus, being in the app stores makes sure that wherever your supporters are, you are there also. Now that we’ve established what an app can do for your organization, you may want more specifics on your situation. What can the app do, how does it work, and how do you get it built? Usually, people think that building an app is really expensive. If you hire an agency to build you a custom app, it is expensive. Agencies usually charge a minimum $10,000, and usually much more than that. With AppPresser, you can get started for less than $1,000. What is AppPresser? How does it integrate with GiveWP? AppPresser is a cloud-based app builder that specializes in WordPress. Apps built with AppPresser allow you to integrate content from your website such as WordPress posts, GiveWP donation forms, WooCommerce, BuddyPress, normal pages, and other plugins. Almost anything that is on your website can go in an AppPresser app. Then, when you update something on your site, it updates in the app. So there’s no need to update twice. Create your app using the AppPresser visual app builder. Then, test it on your device and when you’re ready, submit to the app stores. AppPresser is not a 1-click site-to-app converter. It’s an app builder. It will not automatically add your WordPress contents. With the app builder, you can choose what content you want to use from WordPress and add that to your app in a variety of ways. You can then customize the colors, app menus, and everything about the app. Then to make your app available to the public, you need to submit it to the app stores for iOS and Android. To give you an example of how it works, let’s say you want to add a GiveWP donation form. You add a page to your app and then insert the form component with your donation form url. It’s like a shortcode in WordPress. Add your donation form using the form component. This page can be customized however you like, for example by adding a text-to-give number, your address, and other donation options. Your fundraising app forms have fields for an email and amount. Then the app sends users to your website on a mobile browser to complete the donation. Apple does not allow you to take donations inside the app itself, you must refer users out to Safari. It works the same way on Android systems. AppPresser also allows you to do much more, including login and registration, selling products via WooCommerce, and adding events or contact forms. Essentially, anything you publish on your WordPress website can go into your mobile app. Now that you’ve seen how to build your app, your head might be spinning with possibilities. Do you want a purely fundraising app? Do you want an app to help you tell your story and push updates to your volunteers? 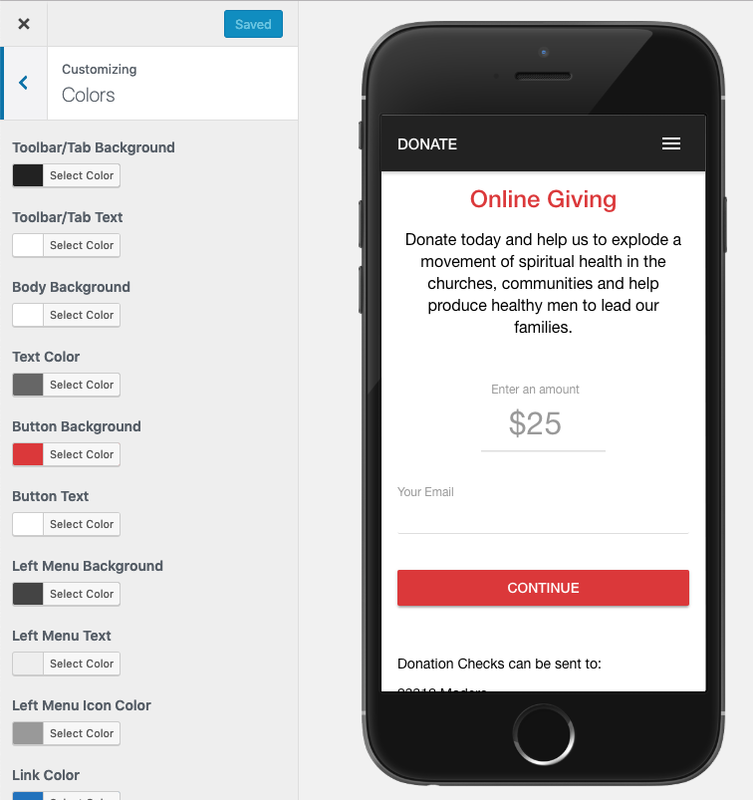 How are other nonprofits using mobile apps? You may have seen apps by large organizations like the Red Cross or the Gates foundation, but their budgets are much larger than the average nonprofit. Here are some great apps built by small foundations with limited budgets to give you more ideas about how you can create your own. Every Man Ministries is a local nonprofit that engages with their audience through a mobile app, made with AppPresser. The app features a daily devotional, weekly podcast, GiveWP donation form, WooCommerce book store, and more. App users can listen to their podcasts and download them for offline use, view their daily articles, give donations, purchase books, and receive push notifications. This app is still under development. 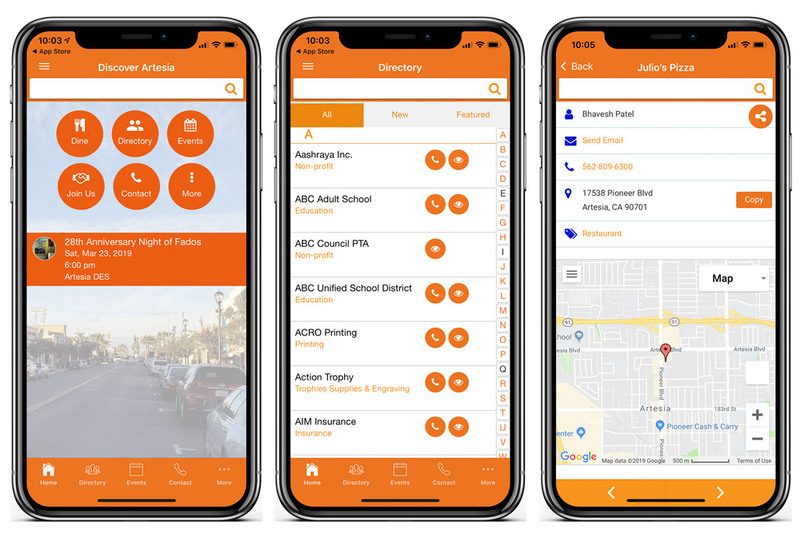 The Artesia Chamber of Commerce utilized AppPresser to create a city guide. It shows off their city’s main attractions, lists a directory of businesses, events, and lots more. 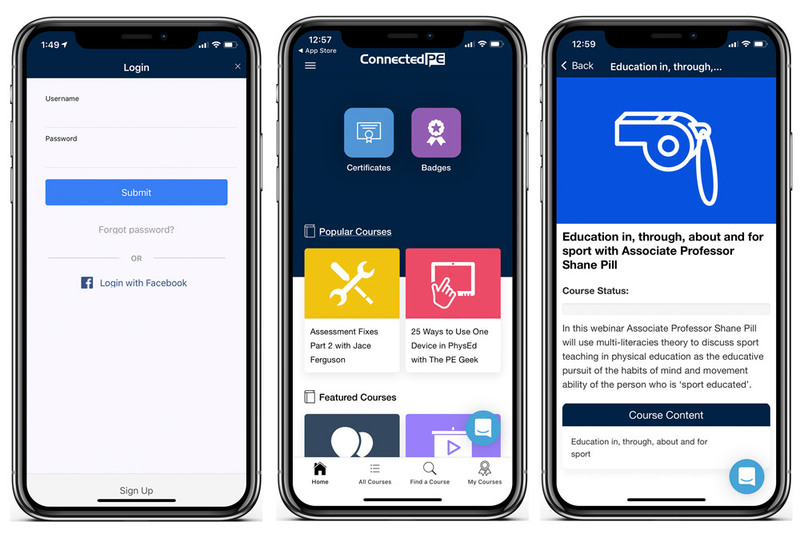 ConnectedPE helps physical educators all over the world learn and collaborate. They can login and access lessons about physical education, chat with other educators, track course progress, and more. Would an app help your nonprofit make an impact? Your WordPress website is built with all the content you need. The only thing left to do is get started. To begin making an app for your organization with AppPresser, head over to the website and pick out a pricing plan that suits your organization. AppPresser offers 10% off for all GiveWP customers. At the time of publication, all Give Customers were sent their discount code in the email subscribed to our newsletter. If you didn’t receive the code, request it through the contact form. Already a customer, but didn’t get the code? Contact us through the form mentioned above and then subscribe to the newsletter so you never miss another opportunity from GiveWP.